This basket has a length of about 8.5 in, a width of about 8.5 in, a height of about 1.5 in and a Net WT of 2 pounds. 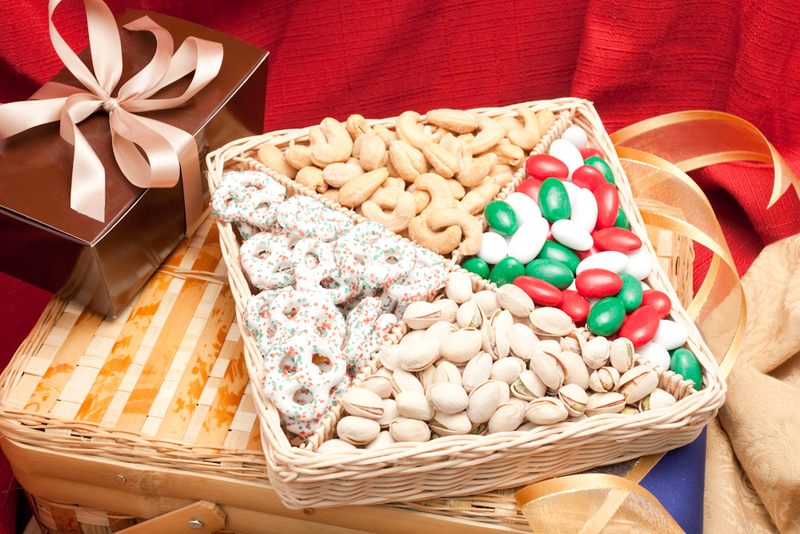 Our Holiday Wishes Supreme Nut Gift Basket is packed with the very finest Nuts and Snacks: Giant Whole Cashews, Colossal California Pistachios, Christmas Jordan Almonds and White Christmas Pretzels. Superior Nut Company - Holiday Wishes Supreme Nut Gift Basket - Net WT 24oz. Pistachios (Pistachios, salt and artificial color); Jordan Almonds (Almonds, sugar, flour, gum arabic, artificial flavors, titanium dioxide, artificial colors (FD&C blue no. 1 lake, FD&C yellow no. 5 lake, FD&C yellow no. 6 lake, FD&C red no. 40 lake, FD&C blue no. 2 lake) and carnauba wax); Christmas Pretzels (White coating (Sugar, Partially hydrogenated palm kernel oil, dry whey, artificial color, soy lecithin, salt and artificial flavor), Pretzels (Wheat flour, corn syrup, salt, soybean oil, sodium bi-carbonate, yeast), Artificial colors. ); Giant Cashews (Cashews, Peanut and/or Cottonseed Oil). This gift basket is an excellent alternative to the "usual" gifts we found ourselves giving, each holiday season -- it's perfect for an entire family's enjoyment. Christmas gift for my son. He liked them. That was the first time I had ordered from your company. Excellent product. Always appreciated by recipient. ConsFreight charge is ridiculous for Boston to Norwell... I paid for express ...It comes in one day anyways. Freight should not be that high for an item more or less 1 lb. I have great and courteous service whenver I call...although I believe I had trouble doing this online, that's why I called someone. However, the people I sent the gift to, rec'd it in a fast way and are always very happy with your products....I don't remember exactly what was troubling me online.....but I know I had to call someone. (Just so you know.) Very happy with service other than that. Can't really say anything about your product, as I have never tasted it myself. I sent as a gift and I doubt that the recipient would ever complain to me! What I was not happy with was the " after " Christmas delivery. I really don't feel it should have taken 8 days for delivery. Free delivery or not.....don't offer it if that's how long it will take. A nice gift at a great price. The recipient was impressed! ProsThe selection of nuts; the price. Highest quality and Service. Actual humans that are empowered to help during laptop meltdowns. Really. One problem: once your friends discover them, they will start shipping in their own addictive cashews - and then what do I give? Many Many Many gifts over the years, ALWAYS rave reviews. Check out the free shipping daily specials- although I think the prices are reasonable given the STELLAR quality. ProsYUM, Fresh, professional, fast, price, quantity, quality, service. ConsPeople figuring out my secret source. Sent as a Christmas gift. Recipient very pleased with the gift. This was my second order from Superior Nut Store, because I was so impressed with the first. I haven't ordered much of this type thing, so I don't have a lot to compare with, but last year I ordered the 5 pound pistachio bag for my husband, and they were GREAT. 100 times better than what you could buy in the grocery store, at least. So I ordered the same again this year, plus this for his brother. I can't vouch for the taste yet, but I received it and it really does look good. Don't be scared to order from this company! Awesome so far.